Make sure your friends, family, acquaintances and colleagues know you collect these crazy old things. I didn’t even realise the benefits of this myself until late last year, when I was gifted with a pattern book for knitted novelties. My unexpected benefactor happened to mention she had a book she thought I’d love and an hour later, it was in my hands. Mine! To keep! On top of this, I’ve had people taking pity on my inability to cultivate a fabric stash by doing it for me. This is awesome, in my opinion, although I’m now faced with the problem of finding a way to make use of this donated stash. As problems go, it a good one to have. 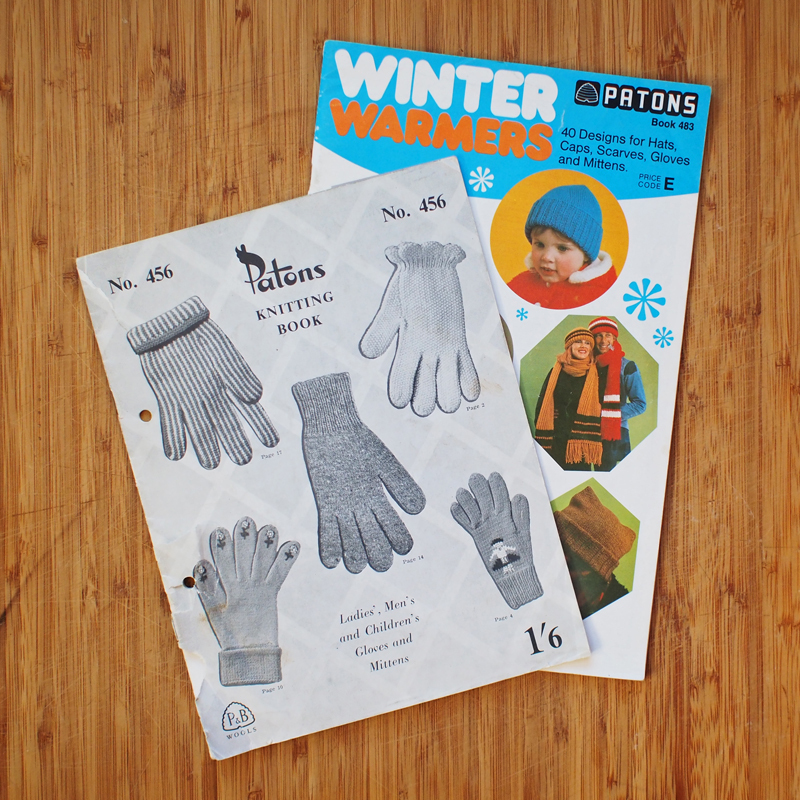 One copy of Winter Warmers in exceptionally good condition and, even better, an entire knitting book devoted to glove patterns from the fifties. Or so I’m guessing. It’s tricky to date patterns when there are no models with helpful hairstyles, so I’m purely going by the book number here. I already have a copy of Winter Warmers (actually, I have two, but the first one is in rubbish condition) but I’d never seen the glove book before – it’s an absolute treasure! Gloves are so much fun to make and they are ridiculously practical. 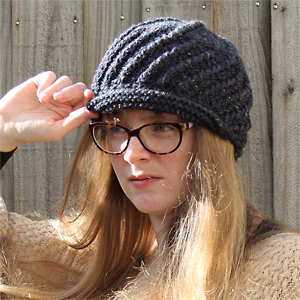 The pair I made last year are one of my favourite makes ever: they’re cosy and warm and I get a huge kick out of glancing down at them every now and then so I can marvel at the fact that I made them myself. And as we move ever deeper into Winter, the idea of making yet more gloves becomes increasingly attractive… and now I have a whole book full of patterns to try! So if you collect interesting old things and you’ve been keeping your obsession a secret, put a stop to that right now. Let all and sundry know what you collect and you never know what might turn up on your work desk of a Monday morning. Ooooh maybe I could add to your stash – now that I’ve moved, I am working through my stuff and desperately trying to cull. Will keep you in mind as I do! That would be amazing! I’ve fallen a bit in love with the idea of matching a pattern to fabric, rather than the other way around. Plus, anything that avoids having to encounter the uniformly grumpy staff at my local Spotlight is a bit of a win. I love telling friends and family about my loves too!! I almost always wind up with things to bring home with me. I must say, I do love the glove pattern book! I never learned to knit anything beyond a scarf though, and I can purl, but nothing else. Cannot wait to learn how to knit properly too. Being able to knit is a brilliant skill and it all starts with knitting and purling – if you know how to do that, you’re well on your way. Now all you need to do is keep a lookout for amazing patterns wherever you go. I agree! There is nothing better than free stuff that you are interested in! It’s like having dozens of extra eyes looking in places you may not visit! It’s wonderful. I too have Winter Warmers, the photos are priceless!!! They are pretty amazing. My favourites are the ones where people are holding apples in their gloved hands because it’s like the stylist was running out of things for people to hold, so they picked the first thing that came to hand. The patterns are brilliant, though. It’s wonderful, isn’t it? It’s like having a little army of minions all on the lookout for you.